German pump manufacturer LEWA has expanded the test range of its specially developed container test bench to deal with hot or explosive fluids. The test bench was initially launched in December 2018 but Lewa has so far only used water as the conveyed medium for testing and verifying pump functions. Many of the fluids Lewa deals with are ranked as supercritical in terms of explosion hazard and employee protection, so the company has now expanded its test range to cover these types of media. In addition to an experimental area of explosion protection Zone 1 where the test experiments take place, the container also includes a safe control room without explosion hazard for housing the drive and control equipment. 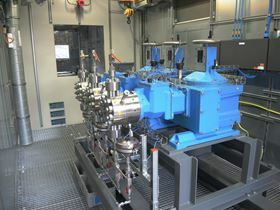 Supercritical fluids such as gasoline, methanol, acetone or nitrocellulose thinner are used in the test chamber, whose interior can be viewed through gas-tight glass panes, at process temperatures of up to 80°C and a maximum quantity of 200 l. A high-resolution data recording system ensures accurate monitoring and results. The initial test has been carried out on the system to check diaphragm clampings for micro-leakage using a low-viscosity fluid and the the Lewa Ecoflow LDG3 type with an M9 pump head. A total of 12 pump sizes will be available by the end of the 3rd quarter of 2019.